Call ACF at 813.235.6357 to find out about our hosting packages! ACF is a Florida website hosting company providing quality hosting solutions for your small or large business. We specialize in windows based hosting and have custom packages that can fit your business and budget. The best part is we are a local company, based right outside of Tampa! Web hosting is easy with ACF Consulting! ACF's hosting services are not only secure, they are reliable as well. With 99% uptime, we offer the peace of mind you are looking for when running a business. 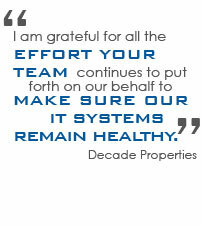 We go the extra mile to make sure our systems are working so you can run your business properly. The key difference between our company and other Florida website hosting companies is our personal approach. We offer custom, "out of the box" solutions for every one of our customers, so you aren't forced into purchasing things you do not need. We take pride in our excellent customer service and IT support and we will take the time to answer any questions or work through any problems you may have. Our excellent support and customer service is what makes ACF a top Tampa web hosting company. If you are looking for a Florida website hosting company that is different from the rest, you've come to the right place! Our friendly and knowledgeable staff will work with you one-on-one to answer any questions and educate you on everything you need. Contact us today to get more information about our hosting packages.